How do I explain my love of the Wing Chair? I suppose one way would be to say that I imagine that God sits in one. 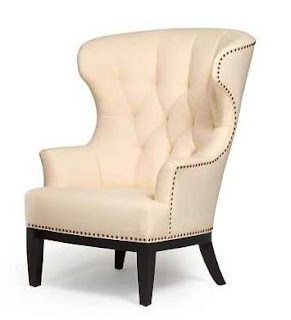 The wing chair is probably one of the most recognizable pieces of furniture. It’s the poster child for traditional design. 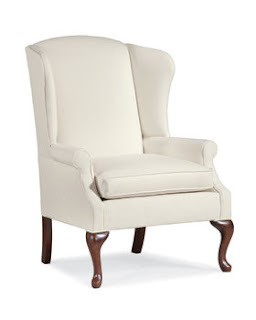 The addition of a wing chair will instantly add class and style to any room. Truth be told, the wing chair transcends design styles. The chair has evolved so much over the years that very modern versions of the classic chair can be found. Because it is so versatile, I think it is one of the best places to add some flair to an otherwise boring room. 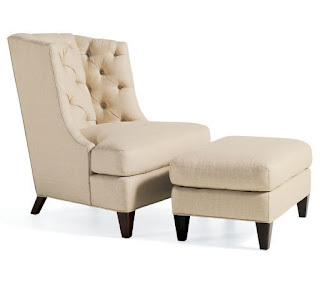 Think of the wing chair as a gorgeous pair of shoes, let it be the focal point of your space. On more traditionally designed wing chairs, the addition of a wonderful striped fabric can add some clean lines which make the chair a bit more modern and relevant for today. Another option is to go old school. The addition of nailhead trim never hurts anything as nailheads are basically the diamonds of furniture. They are always classy and I think they add a bit of texture. Nailheads are a very subtle way of adding style. 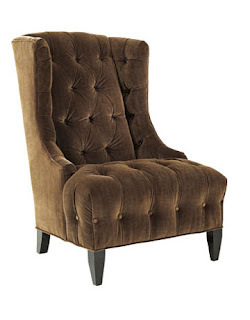 Traditionally, the wing chair was considered a man’s chair. The best placement of one is near a fireplace. On a colder day, the chair was turned towards the fireplace because the high back and wings on each side enabled the heat to isolate. In regards to buying a wing chair, think about the construction as you would any other piece of quality furniture. 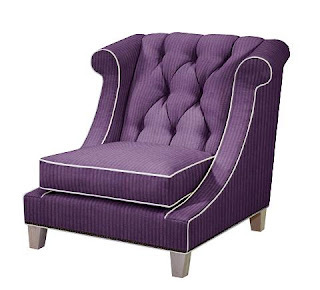 A good wing chair will last for years; keeping that in mind, think of it as an investment piece. If you happen to decide to change your decor, just send the chair out to be reupholstered. 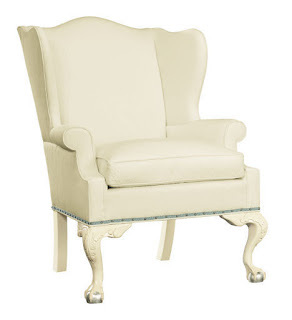 Thomasville Furniture's version of a classic, the Bocelli Chair. Thomasville has many different textiles to chose from for upholstery and it won't break the bank. This chair was designed by the wonderful Celerie Kemble for Laneventure. It's a very plush chair, I think it would be out of place in a very traditional living room. However, I think it would be great in a more transitional styled space. Another great way to use this would be as pair in a master suite sitting room. This beautiful chair was designed by Divine Design's Candice Olson. The Pyper chair does sit lower than your more traditional chair, but I think her goal was to design a stylish and comfortable chair. I think it's perfect for a conversational area. Also, how gorgeous is that purple velvet? The Candice Olson Collection is sold by Norwalk Furniture. This is the Leighton Chair by Drexel Heritage. 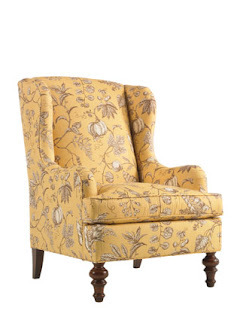 The main reason why I included this one is to illustrate how great wing chairs look with some type of print. This one is a cross between a botanical and a floral but it's not a print that just stands out. Additionally, I like the simplicity of the design. This beauty is the Mrs. Chair from Brunschwig and Fils. I first saw this in House Beautiful. It was recommended by Michael Whaley. I love the femininity of the Mrs. Chair and I think it would look fabulous in fuchsia or a fabric with some fuchsia in it. Another interesting tidbit, Brunschwig and Fils sells the Mr. Chair. Husband and wife chairs, is that not the cutest thing ever? The most interesting feature on the Sherwood Forest Chair are the ball and claw feet. A very tried and true traditional wing chair. Would look good in leather also. Manufactured by Hickory Chair. The Thomas Pheasant designed Moderne Chair is a more contemporary take on the wing chair. I really love the quality of Baker upholstery. The chair looks very deep so I imagine it is very comfortable. I love the first one, I can see why you posted it. It's definitely a classic.